And just when I thought that these books couldn’t get any better, the third one came and completely destroyed everything and knocked it out of the water. 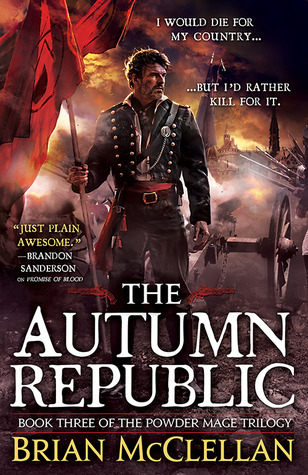 Seriously, I get chills thinking about what went down in The Autumn Republic, the final book in The Powder Mage trilogy. So many twists and turns that I did not see coming, so much emotion poured into these characters as they continued to fight against those turns and twists. I devoured this book, reading those last 100 pages with bated breath. There were two moments, in particular, that truly made my heart stop. If you read my review of The Crimson Campaign, then you know exactly what the first one was. And if you read the last few chapters, then you have no doubt upon the second. This is a war, after all. Of course there are causalities. I just hoped, against hope, it wouldn’t have been [REDACTED]. But I loved this book. I thought it was a great ending to such an amazingly intricate, engrossing and engaging story. It made me even more excited to jump straight into the Gods of Blood and Power (which I, ah, may have done immediately after finishing it, low-key non even ashamed, honestly) because I really wasn’t ready to leave a world so well woven, with characters that feel so real. That’s why I love these books so much, to be honest. Because the characters are just so easy to get attached to, whether I root for them or am rooting venomously against them. If you can give me characters that I form deep attachments to, then there isn’t much doubt I won’t fall in love with your story. McClellan has done much more than that, writing a wonderful series that continuously has me beating myself up for not reading it earlier. Not making that mistake again, *she says as she disappears into the void, her nose buried within Sins of Empire*. Isn’t it fun when you come across a character so wonderful that you either develop a crush or you want to have him/her as your BFF? Thanks for reviewing this one! RIGHT?! I definitely think those gorgeous covers helped, but I couldn’t help but *not* root for him eternally. I just started Sins of Empire and I’m already really excited about it. I’ll have to look at how many novellas there are, too (didn’t even know there were any, tbh).